Posted on March 28, 2016 at 12:44 pm. Before the arts tax, Sitton Elementary in St. Johns didn't have an arts specialist. Now, students receive weekly instruction from art teacher Carlos Baca. Now in its third year, the Arts Education and Access Fund has put an arts teacher back in every Portland elementary school and is transforming the way arts organizations serve our community. At right: Sitton Elementary in St. Johns didn’t have a full-time arts specialist before the arts tax. Now students receive weekly instruction from art teacher Carlos Baca. Like fireworks on the Fourth of July, pumpkin pie on Thanksgiving and debating the merits of the Super Bowl halftime show, grumbling about our taxes in April is practically an American tradition. We know our tax dollars matter; they pay for our roads and bridges, our hospitals and firefighters, and other vital services from which we all benefit in countless invisible ways every day. Taxes are the price we pay for a civilized society, a mark of our collective obligation to each other; but it can be hard to get too excited about watching a chunk of your annual income disappear into the vast machinery of the government when you have no control over how it’s spent and no way to see what impact it will ever have. What if there was a concrete, measurable way to show you the real impact of your tax dollars? What if a little bit of money came out of your pockets and a little bit of money came out of my pockets and it joined together with a little bit of money from everybody else’s pockets and together we transformed an entire community? If you paid your arts tax last year, that’s exactly what happened. In 2012, 62% of Portlanders voted to pass ballot measure 26-146, the Arts Education and Access Fund (AEAF), as a way to stem the tide of a staggering decline in the quality of the city’s public school arts instruction. The city lagged embarrassingly behind national education standards; before the tax, only 18% of Portland elementary schools provided any arts instruction, compared to a national average of 83%. So for the cost of $35 per eligible taxpayer, the City of Portland collects over $9 million which they then distribute partly to schools, and partly to RACC to support arts organizations throughout the region. The arts aren’t a luxury for affluent suburban kids in well-funded schools whose parents can afford dance classes and theatre camp. They’re a vital tool to help every student learn. In a city like Portland, whose citizens value creativity, and where the challenges facing our public schools are a source of concern to us all, it’s no surprise that a substantial majority of voters agreed to back the AEAF and do something about it. The question, of course, is – did it work? According to Marna Stalcup, RACC’s arts education director, the answer is yes. And even better than expected. But it’s not just schools and districts who have used the AEAF as a tool to give their organizations permission to think about the work they’re already doing in a more expansive, innovative way. Grants Officer Helen Daltoso says the same has proven true with the fund’s second-largest program: support for arts organizations. 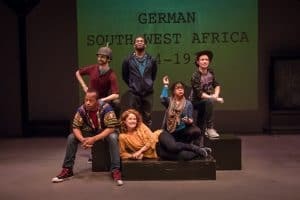 “We Are Proud to Present a Presentation About the Herero of Namibia, Formerly Known as South West Africa, From the German Sudwestafrika, Between the Years 1884-1915” playing at Artists Repertory Theatre through April 10. Teacher salaries are allocated first, so this second pot of money will continue to grow as more people each year pay the tax, but organizations are already making changes. Artists Repertory Theatre Managing Director Sarah Horton says increased operating funds from RACC support a range of community outreach and accessibility programs. Pay-What-You-Can performances and the “Arts For All” program are offered for every season show, opening the doors to low-income audiences, while free student matinees impact over 1,500 students every year, including guests from the “I Have a Dream” program, New Avenues for Youth, and Outside In. And she says RACC’s funding has also helped Artists Rep continue to develop their ArtsHub program, providing crucial performance, rehearsal and administrative space to ten Resident Companies and dozens of very small and emerging organizations at deeply reduced fees. “The ArtsHub protects a space for art and artists in a real estate environment that’s become increasingly difficult for the arts, and gives fledgling organizations, many of whom serve underrepresented artists and audiences, a place to share their work and grow,” says Horton, and the consistent base of annual operating support they receive from RACC each year is a vital tool in helping make that outreach possible. The AEAF is also helping to get money in the hands of artists working in communities that haven’t previously been on RACC’s radar. RACC’s new Arts Equity Grant program (formerly titled “Expanding Cultural Access”) funnels AEAF money to organizations providing services in communities that RACC hasn’t supported, opening the door to a rich, diverse ecosystem of nonprofit organizations that provide vital arts programs and services to an astoundingly broad range of often-underrepresented cultural communities. Last year this fund supported projects ranging from a site-specific photography installation in the Lents neighborhood to summer arts workshops for gang-affected youth. The number of applications increased significantly this year, says Daltoso, and “the breadth and depth of what we received was pretty phenomenal.” Watch for the list of grant recipients to be announced in May. 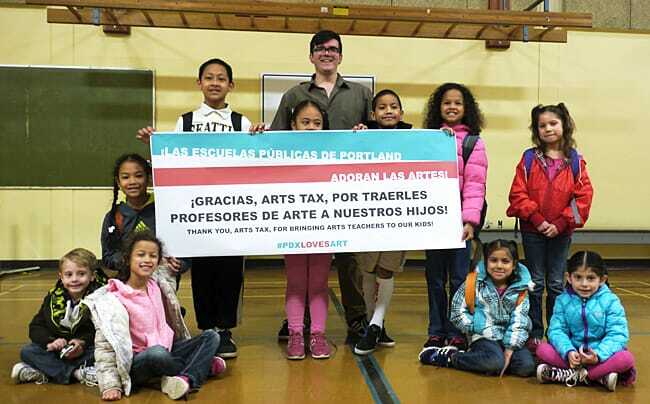 For more stories on how the arts tax is making a difference in our community, follow the hashtag #pdxlovesart. The arts tax is due on April 18 and can be paid online at artstax.net.